Performers include: Jeffrey Pierce, Michael Filipowich, Michele Burgers, Tyrone Benskin, Danny Keogh, Marie-Julie Rivest, Patricia McKenzie, Graham Clarke, and David Dennis. 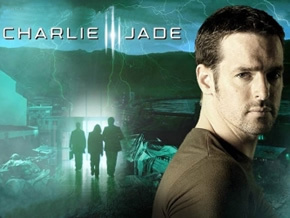 Independent private detective Charlie Jade (Jeffrey Pierce) lives in a world where most everything is ruled by one of five greedy multi-national corporations. Charlie grew up and operates in the largest urban center, the cruel Cape City. Because of this, he knows how to fly under the radar and exploit the system when needed. His life takes a big change when he finds a shivering young woman hiding in his office doorway. She has no identity (an impossibility in this world) and everything about the world is foreign to her. He turns the woman away and, the next morning, is called to the morgue by Detective Sew Sew Tukarrs (David Dennis). Charlie sees the body of the girl from the night before and realizes she might have been telling the truth. He tracks her suspected killer, 01 Boxer (Michael Filipowich), to a secret desert facility that’s owned by the Alphaverse’s biggest corporation, Vexcor. Unknown to him, the company has developed a way to rip through dimensions and to rob the parallel Gammaverse of its precious resources. In the Gammaverse, Reena (Patricia McKenzie) and others try to stop the marauders and create a massive explosion that affects the two universes and a third, the Betaverse. A massive explosion propels Charlie and Reena into the Betaverse and renders the link between worlds impassable. The two must work together to try to find a way to return to their respective homes and to protect their worlds.